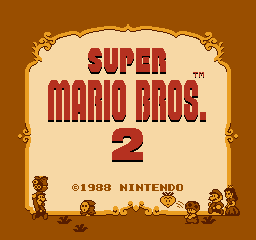 This page details one or more prototype versions of Super Mario Bros. 2 (NES). 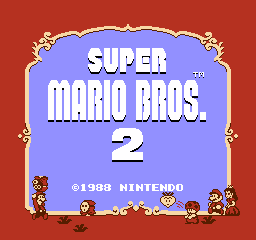 A prototype of the American Super Mario Bros. 2 was bought in cartridge form on eBay and afterwards dumped. 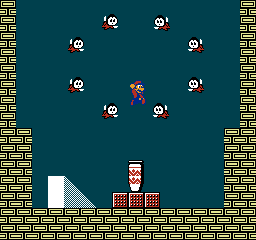 It features some interesting changes done during the conversion from Doki Doki Panic to the final Super Mario Bros. 2. The lamp item from Doki Doki Panic is still present. This was changed to a potion in the final game. The cartridge contains an MMC1 mapper chip, 128KB of PRG ROM, and 8KB of both WRAM and CHR RAM, a configuration that was commonly used for FDS-to-cartridge conversions. 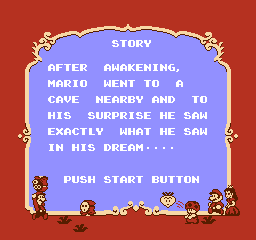 The final game's hardware was upgraded to an MMC3, 128KB of both PRG ROM and CHR ROM, and 8KB of WRAM; this allowed for greater variety in the graphics, animations for objects that were previously static, and the cartoon-like ending sequence. Load times between levels were also shortened, as graphics no longer had to be copied to VRAM. 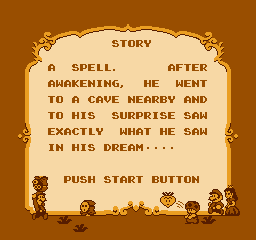 The sound of Birdo shooting eggs or fire starts earlier, immediately as the sprite changes. There is no mushroom on Subspace near the rocket in 4-1. Shaking of the rocket is heavier. Conveyor belt is different from the final version. Wart takes 4 hits instead of 6. You cannot run in this build of the game. But if you die, you get taken back to the character select screen and you can continue from where they died. Normally, you have to stick with the character you started with and keep going. You can select which world to start in by pressing A a certain amount of times on the title screen. If you don't press A, it defaults to World 1 (obviously), but by pressing A a number of times corresponding to a certain world, you can start on any world you want. 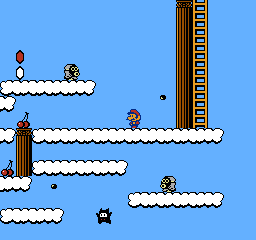 However, there's no limit on how often you can press A, leading to the ability to start on invalid worlds (much like the so-called "Minus World" in Super Mario Bros.). These worlds may crash the game or load another world with corrupted graphics. In addition, it may cause the graphics in the character select screen to become messed up. If one manages to complete the level, it will load the next level from whatever world was loaded. Also, pressing A while it displays the backstory does not increase the world, which limits the number of worlds you can easily access through this method. If you press Select during gameplay, you get 15 HP. The life counter becomes a glitchy mess, but it will still work. Note that if you collect a life heart in this state, the life counter will actually overflow. Interestingly, this debug feature was shown in a commercial for the game! You can continue an infinite number of times. 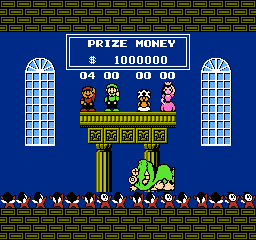 The underground theme is a remix of the one from Super Mario Bros. with loud drum samples, which would later be remade in Super Mario Bros. 3. In the final, it was replaced with a spruced-up version of the Doki Doki Panic underground theme. 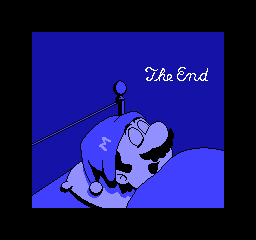 The invincibility theme uses noise-based drums (like Super Mario Bros.), rather than the drum samples of the final. The title screen uses a different, rather monotonous yellowish palette in the prototype which was changed to the final's red/blue palette. 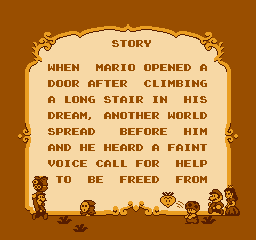 Also, the story has slightly different wording in the prototype, most notably that Mario heard a faint voice as opposed to just a voice. 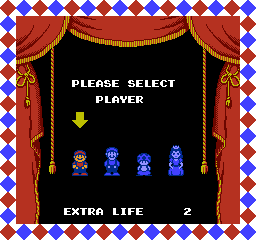 The Character Select screen has an ellipsis between "EXTRA LIFE" and the amount of lives, which was removed in the final for some reason, but added back in Super Mario All-Stars. The prototype is also missing the inside edges of the curtains, though the graphics are present in the ROM. Finally, you start off with 19 lives, which is more than likely for testing purposes. 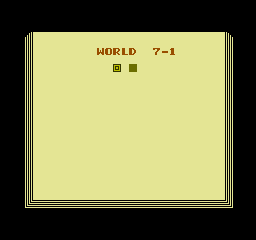 The "WORLD X-X" text was positioned slightly differently in the prototype, and World 7 has no scenery shown at all. 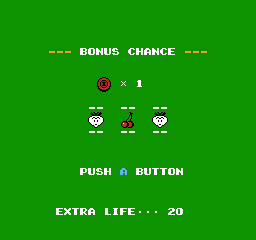 The bonus screen is a completely bland green screen similar to that in Doki Doki Panic. 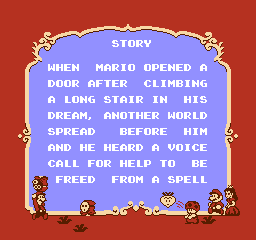 The final uses the prototype's title screen palette with a black background, which itself got reused as the Super Mario USA title screen. 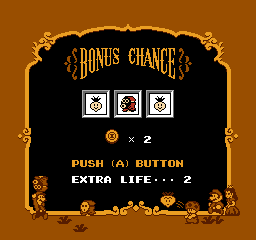 The slots also use the original item graphics, instead of edited ones. 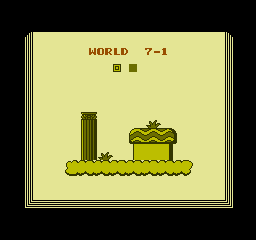 In the prototype, the Mushroom Blocks of World 5 are the same as those in World 1. The final added spots to the World 5 blocks to differentiate them. The tall, lean World 7 vegetable from Doki Doki Panic was changed to a short, squat design for the final. In the third part of 7-1, there was an additional cloud platform to the left of the tall pillar and ladder, guarded by a grey Snifit. It was possible to leap from the Snifit's head and pass over the top of the pillar, thus bypassing a significant portion of the area. 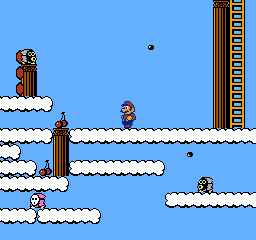 This was somewhat fixed by removing the platform and moving the Snifit onto the short pillar to the left, though Luigi and the Princess can still take the shortcut. 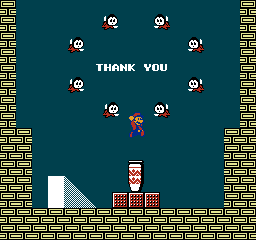 When you release the Subcons from the jar, a Thank You message appears on the screen in the prototype (as it did in Doki Doki Panic). This message was removed in the final. 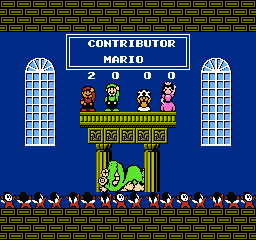 The Subcon release scene is glitchy if you're Luigi or Toad. If you're Luigi, he'll jump inside the jar and pull out the plug. If you're Toad, he'll jump across the screen multiple times, pull out the plug in mid-air, and then continue to fly across the screen. The prize money tiles remain in the final, but go unused. 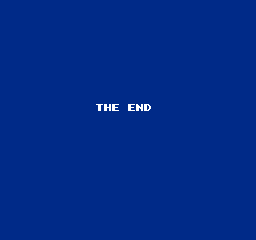 The game ends on a simple "THE END" screen. The Mario scene and remixed Doki Doki Panic intro music are totally absent. Some changes were done to the sprites. But, it seems that for the Character Select screen, that the Prototype sprites were used in the final. Mario, Luigi, and Peach got some white eyeballs for the final. Small Luigi's front foot is less round in the final. Small Toad's feet were seemingly removed in the final. Peach's hair has been altered slightly to be less in her face in the final. Peach's face was redone for the final. Her face was almost unrecognizable in-game. Besides the usual tweaks to the characters, Toad's position of holding a vegetable was tweaked to suit their sprite better. This page was last modified on 26 November 2018, at 16:38.